If you think eating fried food will make your diet go for a toss, then you need to get your hands on this low-fat air dryer from Philips. Thanks to its use of unique technologies, you can now enjoy crispy food which is tender from the inside, without using much oil. Rapid Air Technology Unlike a conventional air fryer, this particular kitchen appliance helps you fry, roast, bake and grill snacks and meals in the healthiest of ways by using minimal oil or none at all, thanks to its Rapid Air Technology. This technology also reduces the smell while cooking. Digital Display Designed to lessen manual work, this innovative air fryer has a digital touch screen display with a 60-minute timer to adjust the time and temperature for precise cooking. 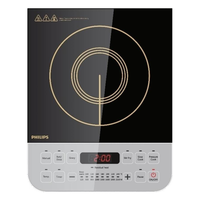 Smart Preset Button With the help of the Smart Preset button, you can save the adjustments of the meal you have cooked, so you can cook the same meal the next time by just clicking on a single button. Capacity This versatile appliance has a large cooking capacity of 1.2 kg, so you can cook a delicious meal all at once when you have visitors at home. More Power Not convinced with how the food turned out to be? Not anymore! This particular feature enhances the performance of the air fryer for best results, so you don't get the chance to complain. Fast and Easy The combination of fast circulating superheated air, optimal heating function and starfish design ensures a faster, easier and healthier way of cooking without having to add oil. Easy to Clean This ink black air fryer is designed in such a way that the nonstick coated drawer and the food basket can be removed easily to clean using a dishwasher. 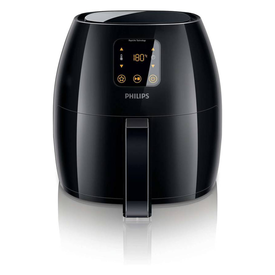 If you think eating fried food will make your diet go for a toss, then you need to get your hands on this low-fat air dryer from Philips. Thanks to its use of unique technologies, you can now enjoy crispy food which is tender from the inside, without using much oil. Rapid Air Technology Unlike a conventional air fryer, this particular kitchen appliance helps you fry, roast, bake and grill snacks and meals in the healthiest of ways by using minimal oil or none at all, thanks to its Rapid Air Technology. This technology also reduces the smell while cooking. Digital Display Designed to lessen manual work, this innovative air fryer has a digital touch screen display with a 60-minute timer to adjust the time and temperature for precise cooking. Smart Preset Button With the help of the Smart Preset button, you can save the adjustments of the meal you have cooked, so you can cook the same meal the next time by just clicking on a single button. Capacity This versatile appliance has a large cooking capacity of 1.2 kg, so you can cook a delicious meal all at once when you have visitors at home. More Power Not convinced with how the food turned out to be? Not anymore! This particular feature enhances the performance of the air fryer for best results, so you don't get the chance to complain. Fast and Easy The combination of fast circulating superheated air, optimal heating function and starfish design ensures a faster, easier and healthier way of cooking without having to add oil. Easy to Clean This ink black air fryer is designed in such a way that the nonstick coated drawer and the food basket can be removed easily to clean using a dishwasher.